It’s summertime, which means enjoying and avoiding hot temperatures and finding ways to cool down. One way we like to stay cool is with ice cream! Back in June, a Chopped episode titled Scoops On! featured the usual mystery ingredients with a twist: ice cream in every basket. We got the scoop on Chef Chris Starkus of Urban Farmer in Portland, OR who was one of the contestants on the episode. 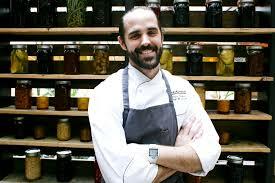 Chef Chris Starkus of Urban Farmer. Picture courtesy of Chef’s Week PDX. FP: Tell us about your experience on Chopped. CS: I had a great experience on Chopped as it was a challenge for myself to think on my feet and execute. Coming from a fine dining background where developing flavors and consistent recipes takes time and experience for high level dishes, I wanted to see how I would do with the challenges that Chopped presented. FP: How did you get your start as a chef? CS: I started as an expediter, bus person and a host when I was 15 and loved the restaurant culture and atmosphere. When I graduated high school, I moved to Las Vegas with the intention to go to culinary school full time. After three weeks in a city where you have to be 21, I was bored and got my first prep cook position with Wolfgang Puck’s Chinois. FP: What do you like most about being one? CS: The thing I love most about being a chef is being around people that are excited by food, how to cook it, where it comes from, how to grow it, how to utilize it and most of all getting to try it all in all forms. FP: If you could cook with any three chefs in the kitchen, who would they be and why? CS: Rick Bayless- He just seems down to earth and has really made sure throughout his career to remain true to the culture and flavors of Mexican food. Thomas Keller– I have had the pleasure of meeting him a couple of times in my career and simply put, I just have respect for him as a chef and restaurateur. Daniel Boulud– I have also had the pleasure of meeting him a couple of times and I love his execution and style of food. Simple and executed perfectly. FP: Can’t go wrong with those chefs in the kitchen! When you’re at home, what are some of your favorite meals to cook for yourself or for friends? CS: I love to make Pasta Aglio E Olio, simple food is just best most of the time. FP: We hear ya about simple food hitting the spot! We know Portland is a great foodie town. Where are some of your favorite places to eat in the city? CS: I would have to say Ned Ludd and Apizza Scholls. CS: I have a huge sweet tooth: chocolate, ice cream, and of course cheese. My pastry chef keeps a close eye on me when I’m in her kitchen. FP: We like the way you think! What are some of your non-cooking hobbies or interests? CS: I tend to six hives, four at the restaurant on the rooftop and two at home. I also love to garden. I have 11 boxes on the rooftop at the restaurant and my wife and I have been working on growing our own food at home. I also play golf, kayak, boulder, enjoy being with my family and riding my bike. CS: Hands down Thailand, I love Thai food and could eat it every day, its healthy and I never feel weighed down after a meal. FP: We love Thai food! We hope to visit Thailand in the near future. Thank you for your time. We wish you continued success.